7) Importing a CSV file with R Studio. RStudio offers a simple GUI user interface to load files into Data Frames. The functionality is of course distinct to RStudio but in practice it is a code creator that uses the read.table() function to load a variety of common file formats to a Data Frame. In this example, it can be observed that the readr package is being loaded, the csv file is being loaded to a data frame called AAPL using the read_csv function. The readr is a more efficient package for the importing and exporting of data created by the RStudio team and while there are several functions for the import and export of data native to R, these are not especially performant. It is worth noting that this package WILL NOT convert strings to factors, making it a more labour-intensive choice for text rich datasets that are intended to be the source of predictive analytics methods. 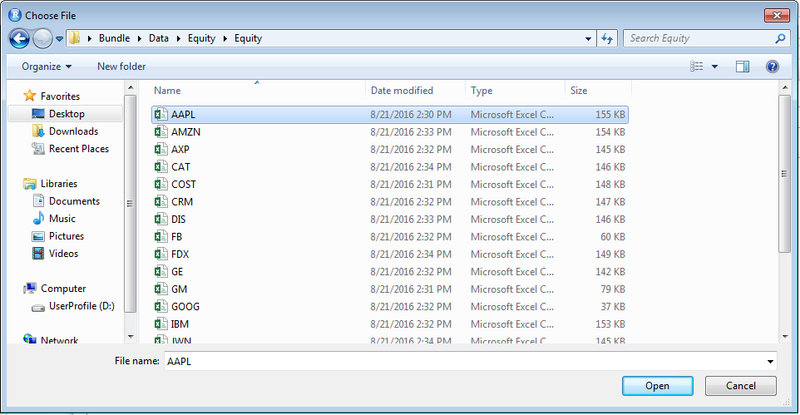 Towards the bottom left hand corner of window is additional parameters available in the creation of the csv file. It is important to note that all RStudio had done is create a block of R script and executed this to console. In the interests of reproducibility and in a script active console passive methodology, this block of script should be reproduced directly in a script. By way of standard, the readr package will be used in most, but not all, importing methods. In this case, it can be seen that the handling of dates has taken place via POSIXCT, which is an alternative date handling object as detailed in procedure 43.